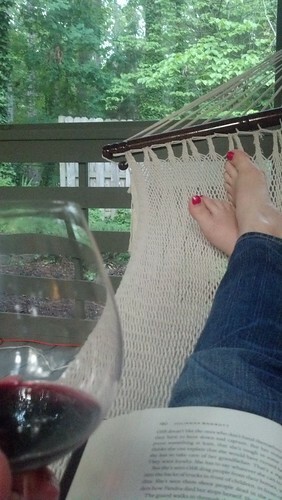 We’ve really been enjoying the screened porch the last several weeks. Even when it’s been warm and muggy, we can turn the fan on and there’s an instant breeze. Add a glass of wine and a good book and my evening is planned! We’ve been eating outside occasionally (taking a break from eating in front of the TV) and generally enjoying the bug-free outdoors. Normally it take Riesling a little while to settle down, but once she can’t see the squirrels (or bunnies) anymore, it’s lights out for the schnauzer. 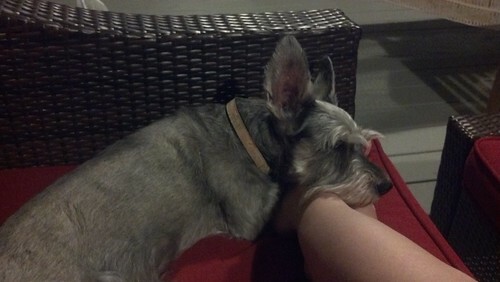 resting on my my ankles… finally!